Meet your neighbor Mark Burgus of Stronghurst. Mark, a resident of Stronghurst for 20 years, said he and his wife, Lisa, enjoy small town closeness. Burgus said, "This is the only place I would want to raise my three children, Kayla 17, Kyle 15, and Kevin, age 13." Instead of leaving the area when he lost his job, during the 2003 layoffs at BNSF, they decided to stay in Stronghurst. He now repairs computers as a "hobby", using some of the money he earns to fund the Boy Scout Troop #5 that he restarted two years ago. Troop 5 stresses community service and a boy lead troop. 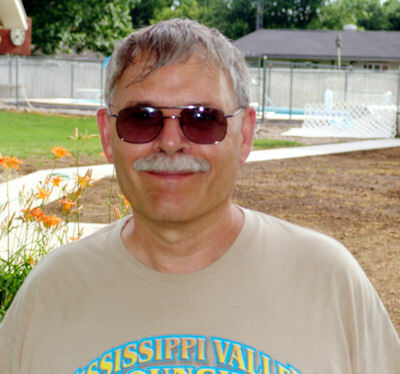 Mark says, "We help with community events like the cannon project, and we also do yard work for several people iin the area that can't do it themselves. "We particularly look after Dorothy Martin. Whose husband Thor was very big in the scouting movement. The adults in this troop take a back seat. The boy's decide what to do, when to do it, and how to do it. And I'm very proud of how they run the troop." Mark has also been a volunteer in Boy Scouts, ambulance driver, a teacher for the Southern school district, and repairs computers for non-profit organizations and government affiliations free of charge. Mark also enjoys gardening and raising five rabbits. The rabbits help with growing ten foot tomato plants which he says, "It's the best fertilizer around." He is also a Lifetime member of the American Legion post 1176 in Biggsville. Mark says, "My hobby has always been computers." He remembers building his first computer from a kit almost 30 years ago. Now he rebuilds old computers and gives them to kids who need them. He can take several old computers and rebuild one good one, which keeps some of the parts out of landfills and recycles the old components. His new hobby combines computers with weather. High on top of his Stronghurst shop sits several weather monitoring systems. He says, "If Stronghurst residents see their neighbor, Mark Burgus, leave home with a raincoat or umbrella, they would be highly advised to follow suit." For the past three years, Mark has been running his own weather station-The Stronghurst Weather Station-and its associated website (burgus.org). His passion for the weather started when his son, Kyle, received a weather station as a Christmas present several years ago. The weather recording equipment, collects data every 2.5 seconds, and has "all the bells and whistles in it." "It sends data off to a central repository in America and they also distribute it worldwide for organizations to use," Mark said. "While the extensive website is a detailed online resource for the Stronghurst community, its data is also being used further afield," Mark says. Mark said "My data is triangulated with other sources for lightning tracking, to do "fairly accurate predictions of where thunder storms are' around a 300 mile area." The burgus.org website, which is updated every 6 seconds, also includes data on humidity, temperature, barometric pressure, cloud heights, wind speed, rainfall, solar radiation and a UV index that even advises how long it will take to get sun burned that day. In addition the website also features weather statistics, graphs, sun and moon data, and government watches and warnings. "There's a lot of science involved in it but it's all automated, so it's not like I'm sitting behind my desk every day and writing weather forecast," Mark said. Rather than being a weather buff, Mark describes himself as a weather "rookie" whose hobby "got out of control", insisting he doesn't know his stratocumulus clouds from his cumulonimbus. While Mark said his weather predictions are 85 to 90 percent accurate, he adds: "like with all the stuff on the Internet, you should not use it for life threatening situations."